With home advantage, Magherafelt will be expected to win the league title. Midweek they had a 1-14 to 1-06 win over Banagher to move to the top of the table on 22 points with one game to play. Kilrea are a decent enough team but being safe may make them not worry too much about a result. Magherafelt slipped up badly against Dungiven but they were short a few key players for that game. They will be stronger for the visit of the Pearses and, led by Danny Heavron, should get the win that will guarantee them the title. That defeat by Ballinderry last week was a setback to Ballinascreen’s league hopes and they could not have a tougher final game that a visit to in-form Slaughtneil. Slaughtneil have a chance of finishing top if they win their last two games and the teams above them all lose but that is unlikely to happen. Mickey Moran and John Joe Kearney will be putting the finishing touches to their championship side and they could well end the Ballinascreen hopes of finishing top. Now that their First Division status has been secured with that surprise win over Magherafelt and the midweek win over Newbridge, the Dungiven players can relax as they travel to play their great rivals of past years, Lavey. No doubt Lavey manager Jude Donnelly has been planning his championship strategy a long way out. His team never had any issues about relegation as they put in a mixture of good and not so good performances. 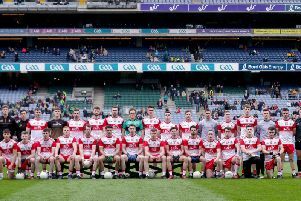 Dungiven need to have all their best players on the field if they are to make an impact on the championship but notably they have been gathering pace in recent games. Still it looks like a Lavey win and a boost going into their championship meeting with the champions Slaughtneil. With Magherafelt beating Banagher in midweek to put the Rossas within touching distance, this is likely to be one of the most tepid meetings of these Lough Shore rivals in a long time, although a Magherafelt slip up could hand the winner the league title. Both have strong championship claims and they will not want to risk injuries with their big games coming up two weeks hence. Loup have been more consistent but Ballinderry have been gathering momentum with improved performances. They have a more experienced team than their neighbours who have been introducing some good young players. Ballinderry manager Martin McKinless has been mixing and matching his starting 15 and this will be final opportunity to do so. They have a good record against Loup and that may continue. Banagher were precariously close to the bottom but Newbridge’s defeat at Dungiven on Wednesday night ended their relegation fears. They host Coleraine at Father McNally Park and meet a Coleraine who have meandered through the league but are in safe territory. Banagher play their best football at home and they could finish the season on a winning note. Coleraine have been badly hit by injuries this season and, as yet, they have not really been at full strength. They may not want to risk any of their injured men and that could leave the St. Mary’s in with a shout of victory. The meeting of the two promoted teams has been in the final round. When the programme was drawn up, many through that this would be relegation battle but this has not been the case. Greenlough are in the clear and Claudy are now safe after Newbridge were relegated after losing to Dungiven midweek. Both play a similar brand of football, attacking from deep and getting the ball quickly to their scorers. Aaron Kerrigan has hit a huge amount of scores for the Mitchel’s this year while Niall Loughlin has been scoring freely for the Clady men despite missing a number of games through injury. When they met in the semi-final of the intermediate championship last year it was a classic. There may not be as much at stake this time but there should be plenty of skilful football on display. Greenlough fancied to win. For many years this was one of the great rivalries of Derry football but in recent times both have slipped back a bit. The ‘Bridge have had testing year and their tenuous hopes of avoiding relegation were dashed when a late flurry of points gave Dungiven victory in midweek. Bellaghy sit 10th of the 16 teams on 11 points. They did make a decent enough start but in recent games results have been hard to come by. Bellaghy have generally had the upper hand in modern times but Newbridge will try and win their first league game of the season even though they are already doomed to lose their senior status.